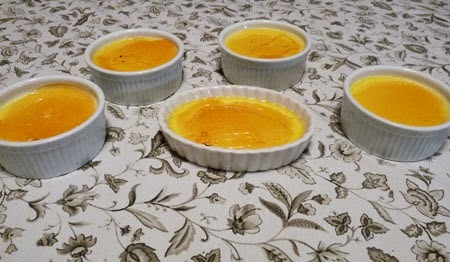 Instead of the traditional cake, I was asked to make Créme Brûlée for a recent birthday. I've made custard before but never Créme Brûlée. The custard part is pretty straightforward. 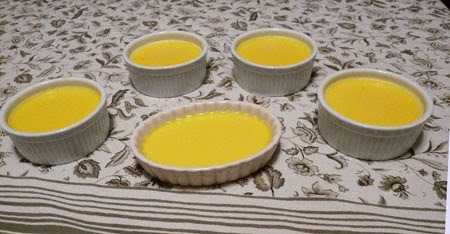 Egg yolks, sugar and cream baked in ramekins in a water bath. There are several ways to make the burnt sugar topping. You can use the broiler or a torch. I was afraid of putting the ceramic ramekins under the broiler and the only torch we have is the one in the basement used for who-knows-what messy repair work. Not coming up into my kitchen. That left cooking sugar and water in a pan on the stove. I read the instructions several times. It was emphasized that the mixture should clarify before being allowed to come to a boil. This was tricky to judge. How clear was clear enough? Then you cover the pan and boil for 2 minutes. Take the lid off and continue cooking and swirling the syrup in the pan until it turns a medium amber, another tricky thing to judge. Was it turning color? Yes, it was. When it reached medium amber, I dipped the bottom of the pan in cold water to stop the cooking. I poured a large spoon of syrup on a custard and swirled the ramekin. The syrup sets up fast and I found it hard to get an even coating. Several trips to the stove to remelt the syrup were necessary. Long brittle strings festooned the pan by the time I was done. The crust shattered when hit with the back of a spoon. They were quite delicious, but very rich. The recipe is from the Joy of Cooking. The online version doesn't cover making the syrup in a pan. I think I prefer a whole milk flan with a runny caramel sauce. The book also has a recipe for custard made with coconut milk that looks intriguing.